In a previous post, I wrote about “Things“. This week, I want to make some points about a certain class of Things, namely…Objects. Why?…On Saturday, I will be moderating a panel at an interior design conference, entitled Aftertaste: The Atmosphere of Objects. Thought I’d get a head start. Loosen up my design chops. I will begin broadly here, and then home in. Firstly, look around and tell me what you see everywhere in the room with you. I’ll answer: Objects. Now,…disregard the human beings (and, unless you’re an analytical philosopher, slap your hand for considering them as such). What are we left with? Inanimate Objects (…okay, some are self-propelled; I’ll allow the iRobot Roomba vacuum cleaner). 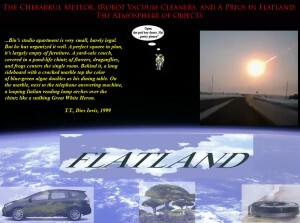 Inanimate objects fall into two further classes: those that are designed – bar stools, lampshades, my Prius, and collar stick-pins, and those that are not designed – the Chebarkul meteor, Socotra Dragon Trees, bauxite, and avocados (Creationists and other shills for Intelligent Design,…stand down). My concern however is less about what objects are, by definition, than what they do. For us – you and me. Everyone knows the bad stuff: provoking vainglorious consumption (in the case of my Prius and the collar stick-pin) or instrumentalist exploitation (in the case of the razed Dragon Trees and strip-mined aluminum ore). But, that aside for the moment, what do objects do for us…existentially? No need for Heidegger here, nor Arnheim, Norberg-Schulz, or the young comer, Peter-Paul Verbeek*. True to my word from last week, I’ll keep this light. Three observations. First, objects orient us in space. If you doubt this, try to imagine what an objectless space would be like…(mathematical physicists? – you stand down, as well). Okay,…maybe Mark Wahlberg in the last scene from The Perfect Storm, or perhaps Gary Lockwood after Hal9000 cut him loose from Discovery One in 2001: A Space Odyssey (yes, there were stars, but a sextant is no help when you’re adrift in the cosmos). These are not bad examples, but consider this: neither guy lasted very long. For good reason. Lived-space comes as a triad: You (1) in a Place (2) among Objects (3). It seems to be a requirement. The “without which nothing“ of human life on earth is perception, and perception occurs only if you’re somewhere with something to perceive – The Abyss and The Void just don’t cut it. This goes to my second point, objects organize space. They make spaces into places. We speak of things “taking place” for a reason. It’s what they do. And objects “place” us most of all – the trees for the forest, one might riff. This Saturday, the podium, the microphone, the seats in the auditorium, my notepad – they will all conspire to tell me where I am and what I am supposed to be doing there. If any one of these objects breaks down, the place breaks down. Frankly, my importance ­– no snickering –­ ­is quite secondary when it comes to the conference. The Atmosphere of Objects needs…well, just that. Thirdly, and this is what I expect to touch on more explicitly at the conference. We tend toward two ways of being with objects – particularly, designed objects. We either view them aesthetically from the remove of our eyes – for example, when observing the composition of a Japanese Tea Room – or, by interacting with them directly according to their utility and/or purpose – as in the performance of the Tea Room ritual. A more quotidian example might be your pleasure in the smart design and flash of stainless steel from your iRobot Roomba vacuum cleaner vs. being down on your knees, trying to dislodge it from the kick-space of your kitchen counter before the motor burns out. It works in the other direction as well: I’m too old to use my baseball glove effectively, but my 1967 leather Rawlings holds pride of place on a shelf between two unique Gubbio Vases in my study. No accounting for taste. Designed objects embody us. They are material complements to the way our bodies are configured. Take my Prius – knurled steering wheel for the fingers, foot pedals for my hinged ankles, and a rear view mirror for lack of eyes in the back of my head (for more on body parts, see DI:E…01.31.13). Designed objects also reflect our values (national flags, nose rings, and, again,…my Prius). Lastly, they help us arrange our little corner of the earth (maybe with Ikea Furniture, or wood-burning stoves, a bean bag chair or two. And, if ever I become homeless?…yup, the Prius). In lived-space, all of this comes together to create an Atmosphere of Objects which allows us and our doings to “take place”. As I’ve asked in previous posts,…how could it be otherwise? Oh, and by the way, three dimensions is not necessarily a prerequisite for objecthood (see “The Square” in E.A. Abbott’s Flatland). * What Things Do (Penn State Press, 2005). I think it’s pretty good. But, it’s a philosophy book….best bone up on your Heidgger, Jaspers, LaTour, and thoughts on “Multistability” before putting it on the bedside table.